I think this little toolbox was a high school shop project. The student had signed his name on the bottom. The price was right, and it had possibilities. First I sawed off the TOO skinny dowel handle. If you really put heavy tools in it, the handle would break. Then I drilled out a hole in each end of the toolbox. 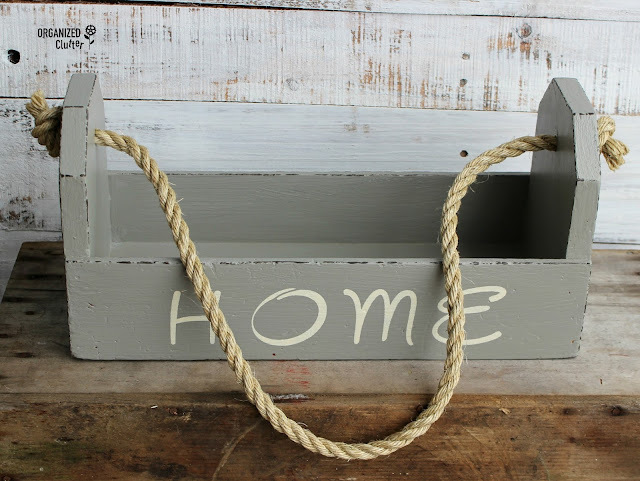 I painted the toolbox with two coats of Rust-Oleum Chalked Paint in Country Gray . I lightly distressed the edges of my toolbox with the FolkArt Layering Wood Block and Ceramcoat Acrylic Paint in Walnut . My layering block technique is here. I added a Minnesota stencil on each end in Ceramcoat black craft paint. My Minnesota state stencil is from an ArtMinds US state value pack at Michael's. HOME is put together from Momenta 2" Alphabet Adhesive Stencil s and Ceramcoat Light Ivory craft paint. I sealed the chalk paint and stencils with Varathane Water-Based Polyurethane Satin Finish . Much more decorative with the upcycle! Fill the toolbox with rustic decor! 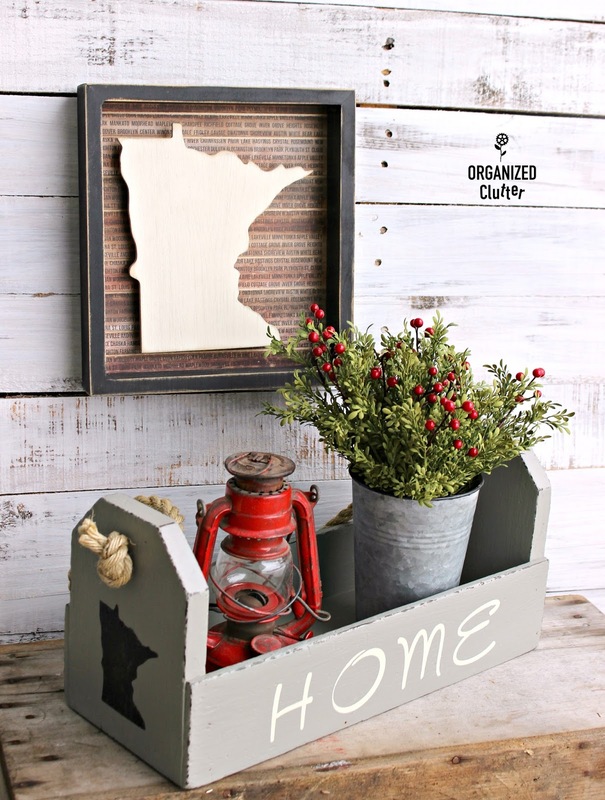 Stencil your home state on each end with the $4.99 ArtMinds Stencil Pack from Michaels. Link above. 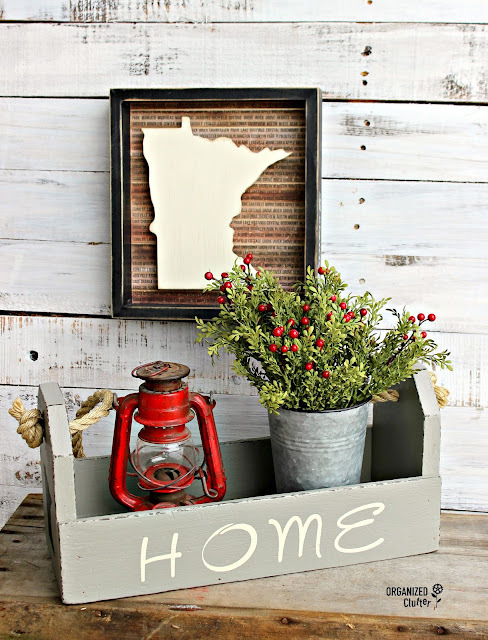 I didn't make this sign with wooden Minnesota cutout and Minnesota city background paper. 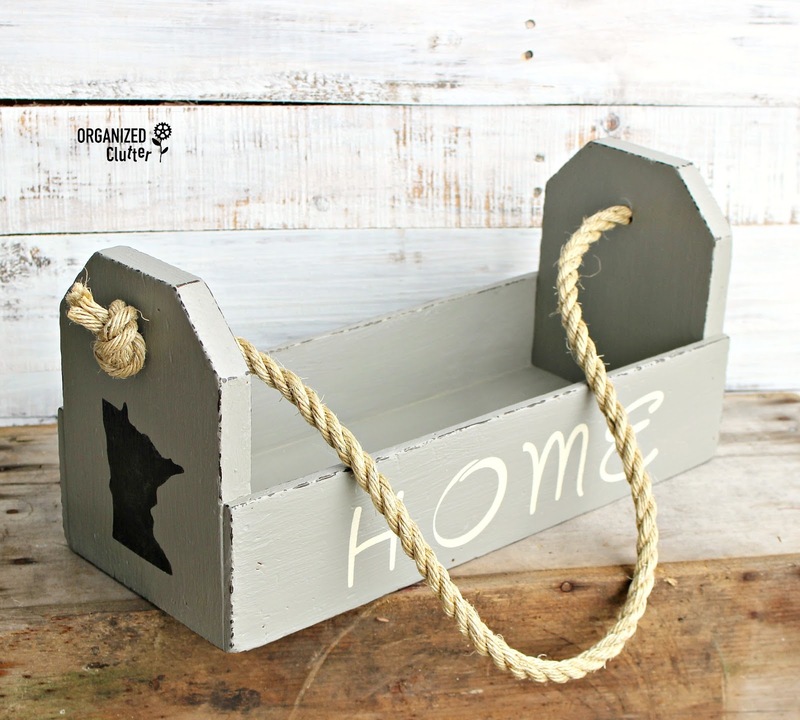 It's from Primitives by Kathy and is available in other states as well. A small red wooden heart is included to customize your area of the state. I love my MINNESOTA home! As always, you have such great ideas for making something special. Great redo. I will be looking for the state stencils!! Fun project. Oh that's super cute Carlene! I love it!